Kitchen Remodeling Ideas Long Island. Do you need your Kitchen Remodeled? Our Professional Kitchen Remodeling Contractors from long island have over 20 years of experience. With their expertise they can help you create your dream kitchen that you always wanted and at a affordable price. The kitchen is the heart of the home. As such, your kitchen designs should coincide with your lifestyle, preference, and budget needs. Selecting the perfect kitchen designs for your home can seem overwhelming when you consider all of the options out there. That’s why Kitchen Designers Ideas is your one-stop resource for inspiration, information, and clarification on the multitude of kitchen designs available. As you explore Kitchen Designers Ideas, you’ll learn about finding expert kitchen designs professionals, choosing your kitchen appliances, tips for kitchen remodeling, and so much more. From your basic countertop microwave to farm sinks for kitchens, to elaborate stainless steel refrigerators, the choices you make in your kitchen appliances can affect the overall appearance and functionality of your kitchen. Kitchen Designers Ideas will show you how to assess your kitchen appliances needs and then give you some viable ideas for incorporating your appliances into your final kitchen design. Learn which appliances work best in small spaces, which appliances are critical for all kitchens, and which appliances you may want to invest in if you are a serious chef. No kitchen is complete without the perfect kitchen cabinets. Kitchen Designers Ideas will show you what options you have in terms of types of material, cabinet accents such as knobs and pulls, style and construction, and types of finishes. Learn the difference between in-stock cabinets, semi-stock cabinets, and custom kitchen cabinets. Get insider information about working with a kitchen cabinets expert and discover innovative ideas for making the most of out the space you have. Find out if you really need all-solid wood cabinets, or if a combination construction would serve your needs. Of course, kitchen cabinets are simply not complete without immaculate kitchen counter tops to polish them off. Options for kitchen counter tops range from the traditional laminate variety to natural stone and tile, and even top-quality granite. Since your kitchen counter tops are something of a crowning jewel for your overall kitchen design, you want to make sure you make the right choice. Whether your preferences lie in contemporary kitchen design or traditional, Kitchen Designers Ideas gives you all of the resources you need to select the kitchen counter tops that match your style and budget, but also provide the durability and functionality you want. 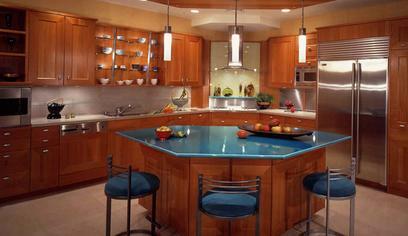 Kitchen designs with islands are popular for homes with larger spaces. Even small kitchen design can incorporate islands into their design with the right amount of planning and engineering. In addition to adding visual appeal and interest to your kitchen, islands can also increase the efficiency and convenience of your kitchen. Use the resources on Kitchen Designers Ideas to decide if you want your island to serve as a food preparation station, or as a home to your stove, sink, or dishwasher. Learn how to design your kitchen around an island, as well as what you can do with the added cabinet and counter top space. The right kitchen lighting is important not only for aesthetic purposes, but also for safety reasons. You have so many options beyond the traditional fluorescent lighting that is so widely used in kitchens today, although there is certainly nothing wrong with the fluorescent option if that is what you prefer. Learn how to spice up your kitchen lighting to really place the final touches on the look of your kitchen design. Kitchen Designers Ideas will take you places you never thought possible with light fixtures. Kitchen remodeling is a monumental undertaking that requires careful planning and consideration. Read through Kitchen Designers Ideas’ tips and advice to ensure your project goes as smoothly as possible. Find out when you need an expert kitchen remodeling contractor and how to avoid unnecessary expenses by laying out your entire project before you begin. Discover ideas on how to make your kitchen remodeling project one that you will love, and will last, for years to come. 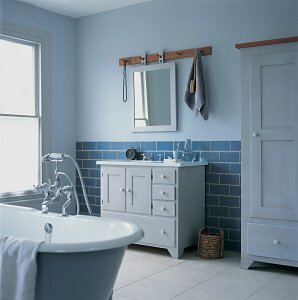 You’ll develop techniques for small kitchen remodeling to even the largest, most luxurious kitchens. Learn how a kitchen remodel can add value to your home if it’s done right. From tearing out your old kitchen to rebuilding your new one, from the kitchen floor plan and up, we’ve got you covered. If you want to give your kitchen a makeover, but can’t afford a full kitchen remodel, kitchen resurfacing may be the way to go. Browse the resources here on Kitchen Designer’s Ideas to learn about the steps involved in kitchen resurfacing, estimating the cost of your project, and hiring a contractor versus doing it yourself. Discover how simply changing the finish on your cabinets can change the entire look of your kitchen. Get help deciding whether you want to completely replace your cabinets or just install new doors and accessories. Kitchen tile isn’t just for your kitchen flooring. Learn about the choices you have in kitchen tile types and colors, as well as the many areas of your kitchen in which tile can be installed. Discover how to create beautiful, custom back splashes by designing patterns with multiple tiles. Learn about the benefits of using kitchen tile for your counter tops. This diverse building material offers infinite possibilities in terms of kitchen designs. Kitchen Designers Ideas tells you everything you need to know. Outdoor kitchens are giving traditional backyard barbeques a run for their money in recent years. If you do a lot of entertaining or simply enjoy spending a great deal of time outdoors, an outdoor kitchen may be just what your home needs. Explore Kitchen Designers Ideas to discover the many benefits of using outdoor kitchens, as well as how to plan and design your very own. Use our site to help you decide how simple or complex you’d like your outdoor kitchen to be, as well as how to set it up to be compatible with your seating arrangements. tags: Kitchen Remodeling LI, Kitchen Renovations Long Island, Kitchen Designs Nassau County, backyard barbeques Suffolk County, outdoor kitchen LI, Kitchen Remodeling Long Island, Kitchen Renovations Suffolk County, Kitchen custom designs New York, Back Yard Barbeques LI, outdoor kitchen Nassau County, Contractor Long Island, Contractor New York, Ideas for every style and budget LI, Kitchen Design New York, budget needs Suffolk County, Kitchen Designers Ideas, Kitchen Designer Ideas Long Island. Our Contractors service areas: Long Island, Nassau County, Suffolk County, New York. Do You Need A Professional Asbestos Company? Do You Need A Professional Asbestos Company? Do you need a contractor that has many years of expertise in Asbestos Abatement and Removal? You came to the right place! Our Contractors Have over 20 years experience in Asbestos Abatement and Removal, have all the licenses, certifications and customer satisfaction to back us up. It is very important to get your Home Inspected to make sure that you don’t have any mildew, water damage or asbestos in any area of your home. If your home is not properly inspected for any type of Water, Mildew or Asbestos then you are putting your selves, children and any pets you may have at risk. Where can I find an accredited laboratory to test for asbestos? Naturally Occurring Asbestos — Learn about reducing exposure to asbestos that is present in naturally-occurring rock formations in certain areas of the U.S., including California. For Asbestos Abatement Professionals — Find out how you can take training to become an asbestos abatement professional and learn about state asbestos accreditation programs. Three companies — including two remodeling firms — have been cited by the EPA for violation of the Lead Renovation, Repair and Painting Rule. Valiant Home Remodelers, a Carteret, N.J., window and siding company has agreed to pay $1,500 to for failing to follow LRRP rules during a window and siding replacement project on a residential home. According to the EPA, Valiant failed to contain dust and waste on the project and to train workers on lead-safe work practices. Johnson Sash & Door of Omaha, Neb., will pay a $5,558 penalty for failing to provide owners of five pre-1978 homes with a copy of the EPA-approved “Renovate Right” pamphlet. The EPA also said that the company did not acquire the proper training. Colin Wentworth — the Rockland, Maine, rental property owner made famous by the now-pulled YouTube video of LRRP violations on his property — has agreed to pay $10,000 for a variety of offenses, including improper renovation methods and failing to acquire the necessary training for the workers. As per the EPA’s investigation, the contractor, who had personally completed the required RRP Rule eight-hour training class, failed to: 1) obtain firm certification from the EPA, 2) post warning signs, 3) contain the work area, 4) contain waste from the renovation activities, 5) properly train his co-workers, 6) prohibit the use of high-speed paint removal machines without HEPA exhaust control, and 7) establish and maintain records necessary to demonstrate compliance with the RRP Rule.Remember, the maximum penalty for the alleged violations is up to $37,500 per violation per day! Do you know how he was discovered? The EPA received a tip, from someone across the street from the renovation, who took a video and posted it on YouTube! The EPA promises to follow through on tips, such as this example, to identify if violations have jeopardized public health.There are many other recent examples of the EPA cracking down on lead paint violations:• On March 23 a Connecticut window and siding company was fined, and has agreed to pay, $30,702 for failing to distribute the required Renovate Right pamphlets to homeowners and residents prior to renovations. This settlement stemmed from an EPA inspection and the subsequent documentation the company submitted to the EPA.• On March 31 a major St. Louis window company was fined, and has agreed to pay, $19,529 in civil penalties, plus the company will perform a supplemental environmental project worth $20,048. These fines again stemmed from a failure to distribute the Renovate Right pamphlets, which is required by the Residential Lead-Based Paint Hazard Reduction Act.• On April 6, a California painting company was fined, and has agreed to pay $32,508.00 for violating the federal Pre-Renovation Rule by failing to distribute the Renovate Right pamphlets. The EPA further stipulated that the company “failed to establish and maintain records necessary to demonstrate compliance with the Toxic Substances Control Act regulations.”• On April 12, a Maine property management company, which operates in 13 states, was fined, and has agreed to pay, $3,542 and will perform an abatement project valued at $31,884 to settle EPA claims that it violated both the federal lead-based paint disclosure requirements as well as the federal Pre-Renovation Rule. The property management company failed to distribute the Renovate Right pamphlets prior to renovations.• The EPA announced on April 21 that a major Omaha, Neb., window company was fined, and has agreed to pay, $3,976 in civil penalties, and will perform a supplemental environmental project worth $11,928, for violating the federal Pre-Renovation Rule by failing to distribute the Renovate Right pamphlets prior to working on pre-1978 residential properties.Even as recently as early May 2011, the EPA’s Region 6, which covers Texas, New Mexico, Oklahoma, Arkansas and Louisiana, sent letters, to contractors, confirming visits to the contractors’ offices to review the overall level of compliance with the Lead-Based Paint Regulations.That’s right; the EPA will be physically reviewing the contractors’ paperwork for ALL of their renovations or modifications performed on pre-1978 properties over the last three years. The EPA will obtain copies of certain documents so that compliance with the RRP Rule (or lack of compliance) can be evaluated. Our Contractors are here to build your New Dream Home. We’re committed to helping you ! For all Your Home Improvement and Remodeling Needs. If you’re looking for high quality and personal service, you’ve come to the right place. At STERLING RESTORATIONS our contractors will give you the attention and personal service you’ll come to expect and enjoy. Sterling Restorations is my company that specializes in residential and commercial property remodeling. I have over 28 years in the construction and property renovation field as a contractor. Sterling Restorations is Better Business Bureau rated at A+ and I guarantee that our customer will be totally satisfied before I consider the work completed. I have testimonials from my clients that will support this representation. With my contracting expertise I not only can restore the property to its previous unblemished state but I can offer exquisite enhancements with my custom finishing. We are committed to helping you achieve your design. If you are looking for high quality and personal service, you come to the right place. At Sterling Restorations we’ll give you the attention and personal service you’ll come to expect and enjoy. Our Contractors are by the phone 24/7 to answer any questions you may have and can travel any where in Long Island and New York to give you a Free Estimate.